As I've stated repeatedly, I try to avoid political discussions like the plague, but yesterday's end of the Iraq War brought to mind many questions that I thought might be worth reviewing in a non-political way. 2) As I read another story about our withdrawal from Iraq (side note: can we please make an effort to pronounce the name of their country correctly? It is NOT eye-rack) I wondered how well we know the country that we've been at war with for the past 9 years. As we were departing the country yesterday the country's prime minister, a Shiite, had the country's vice-president, a Sunni, detained at the airport. If you had to guess what percentage of the population in Iraq is represented by Sunnis, Shiites and Kurds what would you say? If you guessed 52% for the Shiites, 28% for the Sunnis and 20% for the Kurds give yourself a gold star (these are all rough estimates). The point is that during out time in Iraq the Shiites and Sunnis have appeared to be working toward the same goal - namely getting us out of there. However, now that we are gone there is a real risk that the Shiites will decide they'd like to run the show as they are a majority. Oh, and that real big country to the east of Iraq that seems to want to stir trouble --- roughly 90% of their population is Shiite. Here's another step forward in the future of higher education - "On Monday, MIT is announcing that for the first time it will offer credentials — under the name "MITx" — to students who complete the online version of certain courses, starting with a pilot program this spring." This is one of the two models of higher education emerging over the next twenty years. Gone are the days of sending Johnny off to some campus in the rolling hills of Vermont. The college experience of the future is going to be online, rigorous and target specific career opportunities. Stanford opened up a course earlier this year for free and the response has been overwhelming. The professors have said that the quality of work they are receiving from the online students is on par with what they are getting from their Stanford students. I even downloaded one of their courses on App development and watched the lectures while working out in the gym. It's pretty impressive stuff. "MITx" as a non-profit entity established inside the university that will offer an "MIT-sanctioned certificate" for completing various courses or, perhaps eventually, whole course sequences — though MIT emphasized full degrees will not be in the offing. How exactly will it work? On a conference call Friday, university officials were short on many details — how many courses would eventually be offered, how much it would cost, even the name of the first course for the experiment in spring. They did say they would focus, at least initially, on science and engineering, where assessment is fairly objective and easily scaled up. Users might include a high school senior who wants to take an early freshman class at MIT, or college students at overseas universities where a particular course isn't offered. Markets have been spinning their wheels this week in the wake of the "big bailout" last week. A bunch of factors are probably contributing to the current malaise. 1) Confidence is fading fast that this deal can ever receive full acceptance in the EU. 2) The uncertainty has really caused a spike in the US dollar relative to Euro and other currencies. This last point is particularly important to watch. It now takes just $1.30 to buy 1 Euro which is the best exchange for the dollar in nearly a year. The dollar has only been stronger on 2 occasions in the past 3 years. This will mean lower gas/oil prices as the dollar strengthens (yeah!) but it could make it more difficult for US companies looking to sell in Europe (see Intel's comments yesterday about European demand falling off a cliff in the past few weeks). 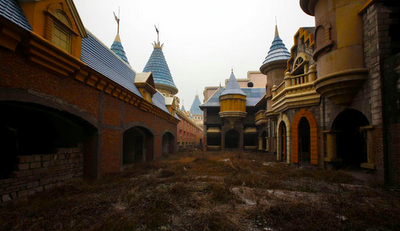 This is the view from inside a "fake" Disneyland style resort that was being built in China about ten years ago when construction suddenly stopped. 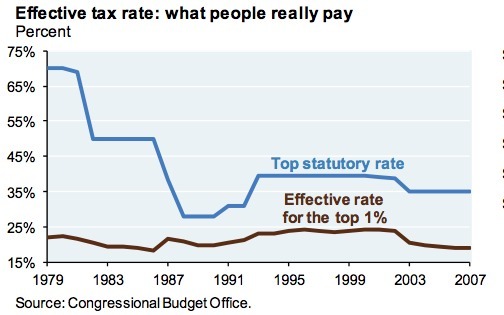 While you'll hear lots of breathless debate over taxes in the coming year note this chart which shows the top US tax bracket over the past 30 years and the actual effective tax rate paid by the highest 1% of earners. European leaders seemed to have cobbled together some outline of a plan but the wording remains very loose. In general, this seems like another attempt to kick the can further down the road and we will be discussing the same issue - European debt levels - over and over again in 2012. The markets seem to like it (but oddly it's just Europe and N. America - the rest of the world was fairly weak on this news), but I sense it's just a relief rally at the prospect of not having to watch N. Sarkozy on TV 25 times a day. This is the most amazing/scary stat I've seen in some time - From 1990 to 2000 there were 29 market trading days where at least 400 of the 500 stocks in the S&P 500 moved in the same direction. This means that on roughly 1% of the trading days or 3 times a year you would get a day where every stock moved in unison. Since, July of this year there have been 34 such days!! On 30% of the trading days since July stocks have moved has one unit either up or down. It's hard to call this a trend, but I think it is a trend and I'll extrapolate it bit further to show how it may impact you. NY State has benefited for an extended period by being the financial capital of the world. Everyone has to have an office in NY in order to gain edge, meet clients, etc, etc. Well, in an increasingly automated world, where stocks trade less and less on their individual merits and more and more on what's happening to the "market" there will be less of a need to operate in NY. I don't have to meet with the CEO of GE if I can just gauge the direction of the market and trade accordingly. This offers a great deal of career flexibility to people like myself but it also means that that the best days of Wall Street are in the rear view mirror. So what, you might be saying? Well, it's worth noting that Wall Street activities account for roughly 20% of NYS tax revenues. As Wall Street shrinks it will have a direct impact on NY State budgets, schools, government employees, etc. It's too early to confirm that this what is happening but let's look back 5 years from now and if NYC starts to get a Detroit feel, we'll remember when it started. #Facepalm - So to say the government wastes money from time to time is like saying water is wet. However, even for a jaded person like myself this story from Michigan was a bit "chilling". 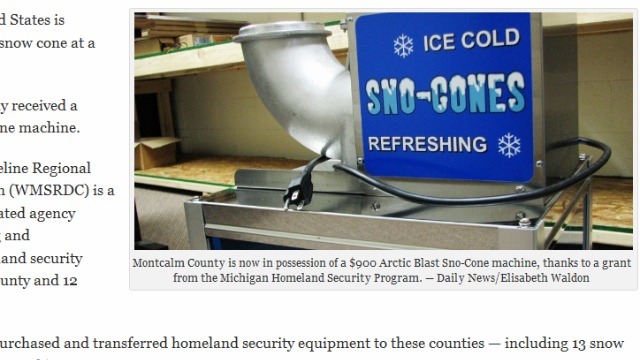 "The West Michigan Shoreline Regional Development Commission, which manages homeland security operations along the western Michigan shoreline, recently gave snow cone machines costing $11,700 to 13 counties under its jurisdiction." However, before you lose all faith in government take heart in knowing that "one county's request for a popcorn machine "was denied." YES!! USA! USA! 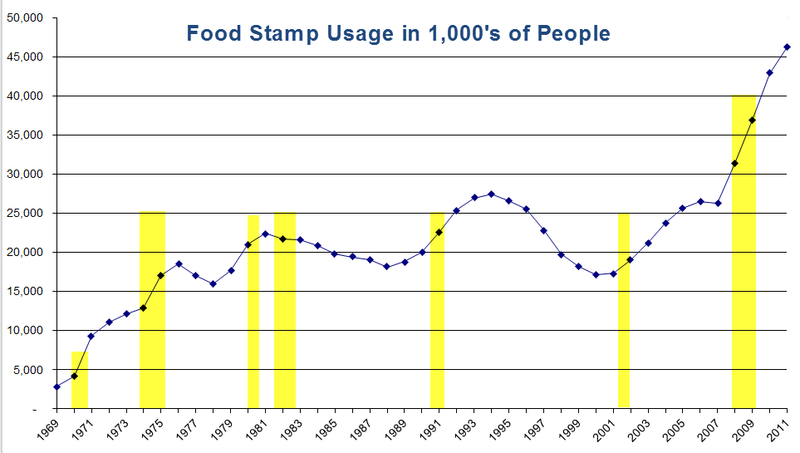 I haven't revisited the SNAP or food stamp numbers in awhile because frankly there has been no change in their trajectory which has been straight up. If, as we are told, the recession ended 2 years ago we should see some leveling off of the food stamp participation but in fact in continues to spike higher. What's interesting to note is that even in the middle of the housing bubble (2002-2007) food stamp usage was growing and nearing record levels. 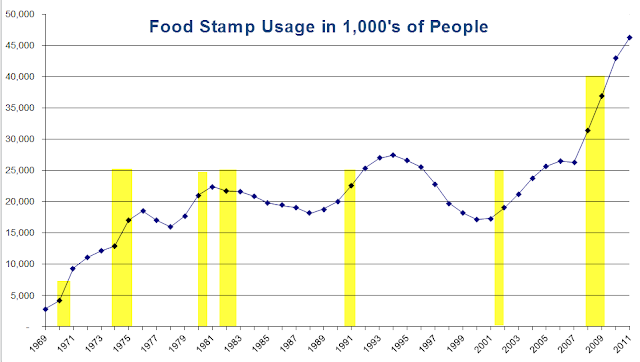 I suspect that some of the increased usage can be attributed to the fact that we switched to electronic benefits which has removed some of the stigma associated with Food Stamps. So @NYgovcuomo announced the best of all worlds today - no increase in taxes and a magic $1.9 billion in extra revenue!!! Yippee!!! The NYS budget was built on the following premise for next year - that the millionaire's tax would expire. The expiration of this tax would have cost the state some $5 billion in potential tax revenues as state income tax rates would have rolled back to pre-millionaire tax levels. The proposed deal will allow income rates in NY to drop for all taxpayers (this is the truth) from the elevated levels during the period when the millionaire's tax was in place. However, if you compare next year's proposed rates to the rates that would be in place if the Governor did nothing, the rates are going UP for many taxpayers. So, it really depends on your point of view: is the compromise a $1.9 billion tax hike on the wealthy or is it a $3 billion tax cut for the wealthy? Consider this example based on rates proposed - a NYS resident making $40,000 will pay $160 less in NYS taxes next yr (compared to 2011 rates) while someone making $1.95 million will pay $41,000 less in NYS taxes next yr.
Again, the spin from the Governor has been that people making $2 million + will pay more in taxes but that's not the complete truth. Those taxpayers will pay more in 2012 than they would have if the millionaire's tax expired as expected, however, they will still pay less in total taxes in 2012 than they do in 2011. A taxpayer earning $10,000,000 in 2011 would have a NYS tax bill of $897,000 and, all other things equal, their tax bill will fall to $882,000 in 2012. However, the Governor claims that he's HIKING TAXES on these people (despite the facts) because their tax bill could have plummeted as the millionaire's tax expired in 2012. Is your head spinning yet? Welcome to the world of politics. the Goliath beetle weighing in at 45 grams and nearly 5 inches long. The US has roughly the same number of kids pursuing "Parks, Recreation, Leisure and Fitness" undergrad degrees (2%) as we do taking Computer Science (2.37%). Perhaps equally disturbing: We have more Psychology majors (5.9%) than Engineering (4.3%) and Math (1%) combined. Well, here we go again. I often wonder if reporters just like having the same story to report every day because they are allowed to cut and paste 90% of an article. This week it will be all about Europe again as a series of meetings leads up to the big 12/9 get together. * Today's headline: "Leaders Piece Together an Effort to Keep the Euro Intact", sounds an awful lot like the stories from 10/5, 10/12, 10/19, 10/26, etc, etc. We'll look to hear something from a German/French meeting today as they try to align their positions in front of Friday's meeting. * Italy looks like they will announce some austerity measures including tax increase, pension reductions and spending cuts. This will likely go over as well as Hawaiian pizza in Rome. So our country to too broke to invest in roads, bridges and rails but China can take all of your Black Friday dollars and use them to fix up America. I get the sense that they would consider this not as a form of new investment but as a way of protecting the investments they've already made. Interesting nonetheless. Quote of the weekend: "We have markets in which the various vested interests are almost completely aligned, we have a brand new Coalition of The Willing which involves the vast majority of investors, governments, Central Banks and regulatory bodies the world over and, amongst that coalition, we have a common willingness to turn a blind eye to the realities facing the world; namely, too much debt and too few ways to pay it off." Well, as you know the devil is always in the details and there are plenty of issues to look at in this month's jobs data. ** First, could Google or Facebook or Twitter lend the government some servers? The Bureau of Labor Statistics publishes their monthly jobs report on the first Friday of every month and every month their website goes down for extended periods of time as every analyst from London to Singapore tries to pour through the data. Bear with me, much of the info I have rec'd so far is second hand. Again, the headline that every news outlet seems to be running with is: "JOBLESS RATE FALLS TO 8.6%". While this is in fact true, it's more a function of math than of an improving jobs outlook. The unemployment rate is a fairly complex calculation but for our purposes let's say simplify it. Imagine a country with 100 people and 10 of them our out of work. In this simple example our unemployment rate is 10/100 = or 10%. Now, imagine that 5 of the unemployed just get tired of looking for work so they are no longer classified as "unemployed" or part of the the labor pool. This means they vanish from the calculation and next month you have 5 unemployed / 95 people in the labor force = 5.3% unemployment !!! Hurray, we're all saved! Of course, those 5 people still don't have jobs, but why muddy the waters with facts. So now, let's come back to the real world. In the US, last month the civilian labor force fell by 315k people that disappeared - basically they stopped looking. Removing them from both the numerator and denominator of the unemployment calculation drove the steep drop in unemployment. Eventually, people will figure this out but it may take a day or so. Our total labor force participation dipped back to 64% which is dismal and the average term for the long-term unemployed is now 40 weeks. The market seems to be happy with this data but I'm not sold on it. 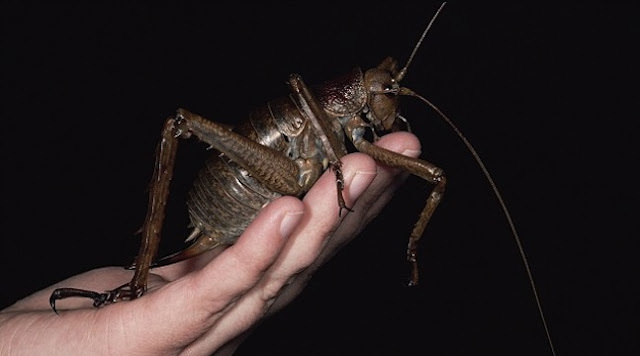 I know a certain member of my family that might never sleep again after seeing this photo of a Giant Weta from Little Barrier Island off the coast of New Zealand.